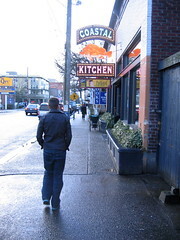 I'm heading off to Seattle for the Matthew Good show. Nathan's coming, so expect to see us on the news trying to scale the Space Needle sometime after the show tonight. That's the sort of ruckus we can get into when we're south of the border. Thanks to Jeff for giving us a place to crash, and I hope you all have fun while I'm gone. If you want to come in and finish cleaning my apartment while I'm away please feel free to do so.